MAIIAM can be easily reached by various transportation. Take Main Road 1006 Thanon Chiang Mai – Sankampang (old route) in the direction of Sankampang district. Once past Krok Siwilai Intersection, Ton Pao Pattana Intersection and Bo Srang Intersection continue on the same road for approximately 1.5 km and MAIIAM Museum of Contemporary Art will be on your right. Parking is available in the parking lot next to the museum otherwise street parking is also possible. 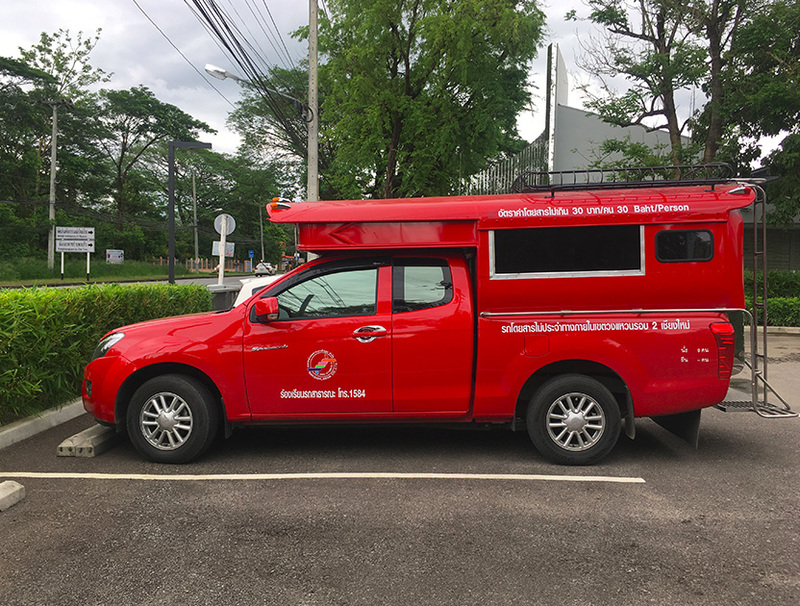 Other modes of transportation available from Chiang Mai city to MAIIAM include a variety of different buses, taxis as well as mobile apps such as GRAB and Uber. The white car or bus is a public mode of transportation that runs between Chiang Mai City and Sankampang district. The bus fare is at 15 baht per person. Please board the bus for Sankampang at Worarot Market (Kad Luang). You can inform the bus driver that your destination is MAIIAM (or the building that has the mirror wall on Sankampang Road). To return to Chiang Mai city you can board the white car in front of MAIIAM. 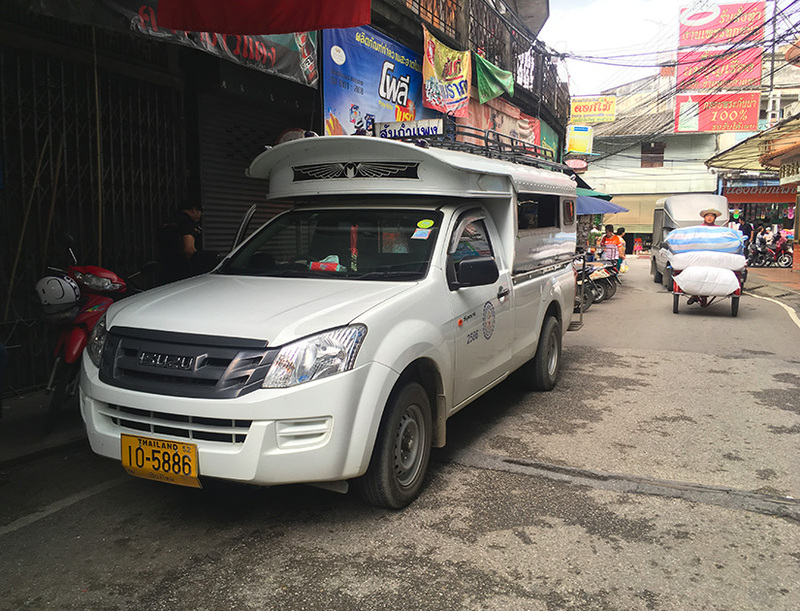 The white cars from Sankampang District into Chiang Mai City run until around 18.00 hrs. Please inform the driver that you would like to be dropped of at the MAIIAM Museum of Contemporary Art on the Old Sankampang Road around 1.5 km past Bor Srang Intersection. The Museum will be on the right hand side, the driver will recognise it as the building with the mirror wall. Please enter MAIIAM Museum of Contemporay as the destination in the Uber or Grab app. Friendly note: There are often promo codes available on these apps for Chiang Mai. Kampangkaew Café is MAIIAM’s restaurant serving visitors both Thai and International Cuisine with a diverse of offering of drinks, coffee, tea and cocktails. The name Kampangkaew or Glass Wall is a nod to the giant glass mosaic that is the façade to MAIIAM. Enjoy a meal or simply drinks whilst watching the world go by on Samkampang Road from Kampangkaew Café. MAIIAM’s Museum Shop offers a distinct shopping experience where in the light glass walled space artist books sit easily with the musem’s own merchandise and collaborations with Thai aritsts and designers. Many of the products on offer are exclusive to the Museum Shop where the MAIIAM team have worked cafefully with artists and young Thai designers, both well-known and emerging to create unique souvenirs and limited-editions designs. Within the book offerings, rare artist books have been sourced from all over the world with hard-to-find copies and limited eiditons available in the Museum Shop’s bookshelves. In addition, gifts and souvenirs that are made by MAIIAM as well as gathered from the trips around the world complete the unique selection on offer.